Last week I posted about my first Stitch Fix and my goal to start my first wardrobe capsule. Today I wanted to share a few of the details of that wardrobe capsule! But first, let me go a little deeper. For a while I have felt challenged to simplify. I have never been the best at getting rid of things. Cards, clothes, any sort of gifted item. You name it. Mr. Christopher is the same way. So over the years we have acquired things. Lots of things. We have gotten rid of things too, but for the most part we tend to acquire more things than we get rid of in a given year. And deep down I knew I really didn't like this. I knew that I didn't like that I had to go buy more hangers every year in order to fit all my clothes in my closet, rather than just getting rid of more. Then the summer happened and we found out we were moving and we realized that we had a unique opportunity to downsize our stuff. I spent an entire week with one of my best friends combing through every nook and cranny in our house sorting our things into a "throw away," "yard sale" and "giveaway" piles. I gave away at least four large trash bags full of clothes, just my clothes! But that was just the easy stuff. (Can you believe that I had FOUR trash bags full of clothes that I EASILY got rid of? Easy: as in I can't even REMEMBER what was in those bags)? Then came the hard part. When we moved into our current home and I felt convicted again of our stuff. 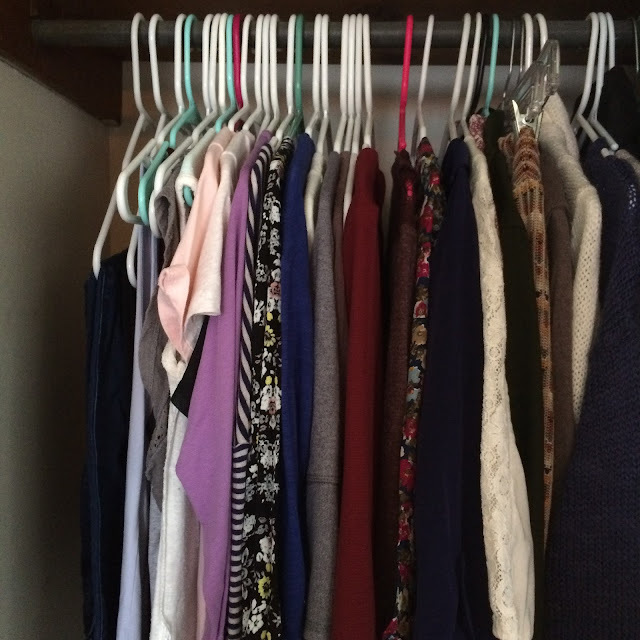 Yes, we had downsized our stuff (We estimate that all-in-all we got rid of or sold about one-third of of our stuff), but I still felt guilty that I had clothes in my closet that I hadn't worn in over a year. Over the last few weeks I've been returning to my closet over and over again to get my wardrobe down to 37 pieces. It took me weeks to actually do this because it was so mentally difficult. And that's when I realized the reason why I keep so many of my clothes: guilt. I feel guilty for buying them, so I keep them in my closet. I feel guilty that someone gave them to me, so I keep them in my closet. I feel guilty that I haven't worn them this year, so I keep them in my closet. Guilt keeps my closet perpetually full with things I don't really want or need. After weeks of reminding myself that I don't need to feel guilt over these things I limited my wardrobe down to 37 pieces. Everything else I gave away or put aside for my Spring/Summer wardrobe capsules. My wardrobe capsule will run for the next three months and hopefully in February I'll have enough guts to start over with a Spring wardrobe capsule. We shall see! Side note: I do want to say that in all of this my goal is to honor Jesus. I believe that I am honoring him in placing limitations on my wardrobe, not buying whatever I want, whenever I want. I also don't want to worship at the throne of simplification, because I think that could be easy too. The wardrobe capsule has been a great, helpful tool to getting my wardrobe simplification started. And that's that! This is so cool! I checked out the link for a wardrobe capsol in your last post. It's so inspiring! Now that I share a closet with my husband it's obvious I have too much stuff and a large chunk of it rarely if ever wear. I really want to give it a try thanks for sharing!! I really need to work on this! Thanks for sharing. You're welcome Leslie and Beth! Thank you so much for your encouragement in it. Let me know how it goes if you try it!